Dr Michael Lange has been taking care of patients since March 1993 and has seen how poor diet has negative impact on his patients. He has been involved in nutritional research to support ocular and overall health. More and more people are plagued with digestive problems and are not fueling their bodies with the beneficial nutrients to promote overall wellness. The typical person today is eating overly processed, calorie dense, nutrient deficient , fast food filled with pesticides, hormones and antibiotics. Dr. Lange recommends an all organic gluten-free paleo type of diet to his patients, family, friends and radio listeners. However even on this particular type of diet many people will still notice significant bloating, tenderness in the abdomen, belching and gas after eating this type of diet. Many of these people have irritable bowel syndrome (IBS) and specific fruits and vegetables can cause these symptoms as they go thru the digestive system. 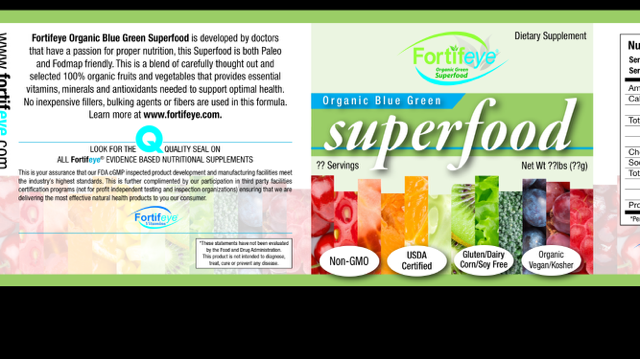 Dr. Lange and Fortifeye Vitamins decided to research and develop a powdered super food using all organic and non gmo fruits and vegetables that people could consume that were on a low carb diet, diabetics and people with IBS. People with IBS will react poorly to certain fruits and vegetables that actually cause fermentation and gas in their digestive system. These type of foods are called FODMAP which stands for Fermentable oligosaccharides, di-saccharides, mono-saccharides and polyols. These are very common foods in the typical American diet and new research indicates that restricting these foods may benefit irritable bowel syndrome (IBS) and other functional gastrointestinal disorders (FGID).